Tagline: Buy the ticket, take the ride. Fear and loathing in Las Vegas is about two men (both users of hallucinogenic drugs) who go on a trip (pun intended) to Las Vegas, in search of the "American Dream." Their roles are played by Johnny Depp and Benicio Del Toro. 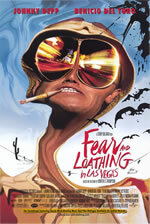 Fear and loathing in Las Vegas has some very weird scenes which could evel lead the viewer to believe that the filmmakers were using drugs too. Many scenes rival even the Cheech and Chong films.